Silver fox Richard Gere is back in business. So here we’ve got absurdly wealthy hedge fund manager Robert Miller (Richard Gere, in his best performance since playing Clifford Irving in The Hoax), a one percenter who doesn’t even think about, never mind care about, the unwashed rest of us, in the midst of selling off his very successful family company. And let no one dare to get in his way, even though while he smoothly glides from private jets to glitzy parties, sips from his private stock of fine scotch, and keeps a slinky but demanding mistress Julie (Laetitia Casta) secreted away from his supportive, homebody wife Ellen (Susan Sarandon), things start going wrong. We learn very early on that he keeps two sets of books, and one of them is very cooked. We witness, shortly after Ellen pleads for some vacation time with him, that he instead runs off with Julie. This is a bad move since that decision leads, in short order, to Julie’s demise. Don’t worry, that spoiler is a tiny one in the scheme of things. This is a story of a man whose perfectly ordered life is rapidly becoming unraveled. Aside from a few out-of-left field plot surprises, there’s nothing all that startling going on here. We’re deeply entrenched in character study territory, with Gere displaying something of the persona he wore way back in Pretty Woman, but coming across clearly and obviously as a bad guy. What’s most fascinating about the script is that while it initially looks to be about a man who is nonchalantly committing a series of cover-ups, it eventually shakes out to be as much about the other people around him. Some are oblivious of his activities, while some believe, but can’t prove, that they’re on to him, and want to bring him down. 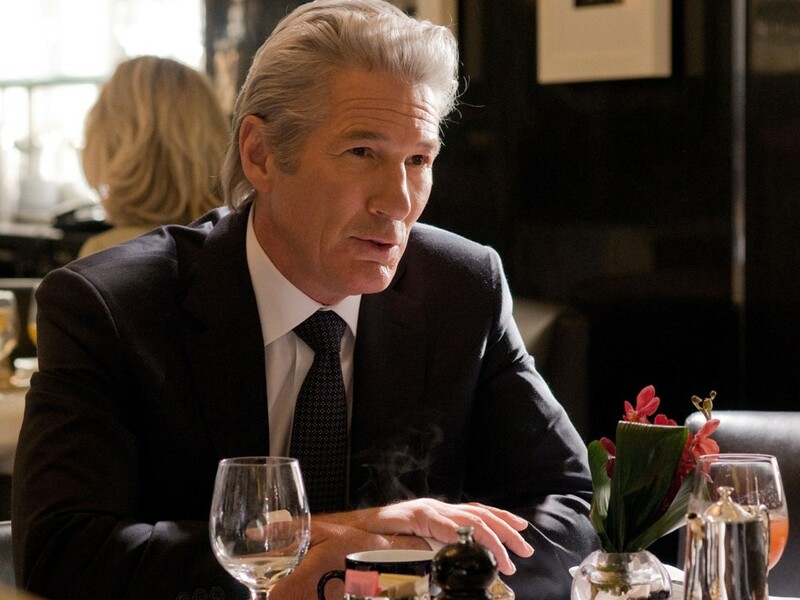 Some of the best written and acted scenes are the uneasy ones between Gere and Brit Marling (very good in Sound of My Voice, and excellent here) as his daughter, Brooke, who is also the company’s wary, by-the-book chief investment officer. But all bets are off for anyone, including Gere and the equally excellent Sarandon, when the film introduces sharp but world-weary Detective Michael Bryer (the always great British actor Tim Roth), who takes on the case of figuring out just what went down with that mistress. It’s not just the weird yet convincing New Yorkish accent he dons; it’s what he does with his entire body. I can’t recall any movie in which a character is so physically relaxed, he pretty much becomes part of the chair or couch that he plops down on as he starts a conversation. It’s as if he doesn’t know how to sit; he only knows how to lounge. The one complaint that can be aimed at first-time feature writer-director Nicholas Jarecki is that he gets a little too ambitious in making the story bigger and broader than it needs to be. The character of Jimmy, an “acquaintance” of Robert, with an elaborate back story, takes up too much of the film’s space. And the final reel is chock-a-block with plotting that’s supposed to wrap things up neatly, but gets a tad confusing before it’s all resolved.